Gulak, the headquarters of Madagali Local Government Area of Adamawa State, is currently under attack by Boko Haram terrorists. 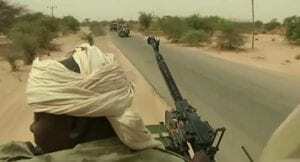 The Adamawa State Commissioner of Information and Strategy, Ahmad Sajoh, told Channels Television that the military and the insurgents were engaged in a fierce battle with residents fleeing for their lives. According to him, the vigilance group in the town and the hunters association are assisting the military in a bid to repel the attack and gunshots can be heard all over. Many scared residents have fled the town and are hiding in the bushes, mountains, and hills. The Chairman of Madagali local government area, Alhaji Mohammed Yusuf, also confirmed the attack to our correspondent in Yola. He described the attack as very heavy and likely to result in the loss of lives. According to Yusuf, tonight’s attack comes barely 24 hours after two male suicide bombers entered the home of a family in Tsilah village near Madagali and held a woman and her daughter hostage. Thereafter, they detonated the explosives strapped to their bodies killing both of them, the woman and her baby in the process. The Police Public Relations Officer, Adamawa State Command, SP Othman Abubakar, when contacted, said he would call back with information. He has yet to do that, however. Meanwhile, the Adamawa State Commissioner for Information said the government is monitoring the situation. Today attack also comes less than 10 days after two female suicide bombers attacked Dar, a village near Gulak. The first of the two attackers detonated the improvised device strapped to her body around 8 pm on Saturday, October 28, while the second did the same around 7 am on Sunday, October 29. A woman with an eight-month-old baby strapped to her back was hit by the second attack (on October 29) and lost an eye, while her baby sustained minor injuries in that attack, which is believed to have been targeted at a church.